Sam Rayburn is a beautiful east Texas lake with over 114,500 acres and 560 miles of shoreline - which makes Sam Rayburn Reservoir the largest body of water wholly within Texas. Construction began September 7, 1956 and the reservoir began serving its main purpose for water conservation, flood control, water recreation, and hydroelectric power on March 29, 1965. The terrain is rolling heavily treed terrain and the vast majority of the lake is undeveloped because the lake is surrounded by the Angelina National Forest. 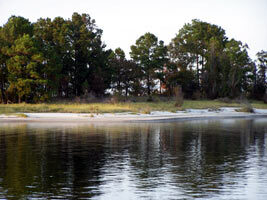 There are lots of coves for fishing, skiing, boarding, or just dropping an anchor and enjoying the view. You'll also find plenty of sandy beaches and great swimming water. Fishing is good and the north end of the lake is covered with trees which are home to some huge fish. 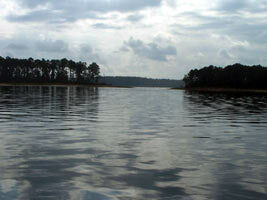 The maximum water depth is 80 feet' and Sam Rayburn is one of the clearer lakes in Texas. There are a number of good Corp of Engineer Parks for lake front camping, ramps, and day use areas. 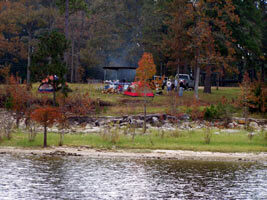 And you'll find several private RV parks with cabins, ramps, pools, and more. Gas is limited on the lake, so prepare accordingly. We know of one restaurant on Sam Rayburn but haven't tried the food. 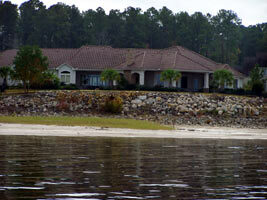 We are not aware of any private lake front homes available for rent. Read Texas Outside's Review of Sam Rayburn to learn more about the lake and what to see and do. Sam Rayburn offers good fishing and these guides will help you land a big one!